The real estate slump could get worse before it gets better. Business 2.0 Magazine, in its November 2006 issue, identifies 10 markets that offer great opportunities for those who have the patience to buy and hold. Nestled between the Cape Fear River and North Carolina's Inner Bank beaches, Wilmington has great golf, mild weather, natural beauty, and a relatively cheap cost of living, all of which make it popular with both permanent residents and second-home vacationers. But it hasn't always been this way. It was an isolated backwater until 1990, when the final 120-mile stretch of I-40 opened. Now the Research Triangle's well-heeled tech workers can be at the beach in three hours. 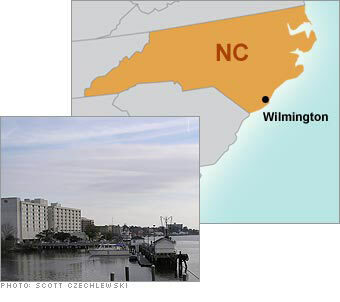 As the only city of any significant size on the North Carolina coast, Wilmington may be just at the beginning of its boom. It has a seaport, an international airport, and a UNC campus. But it has also maintained its "historic" ambience, bringing it another revenue stream: Hollywood has filmed 180 features here during the past two decades. CAUTION: Wilmington has seen a high proportion of speculators invade the region in recent years. Barron's estimated last year that 38 percent of its homeowners are nonresident investors who use their properties only occasionally, if at all. One other word of warning: hurricanes.